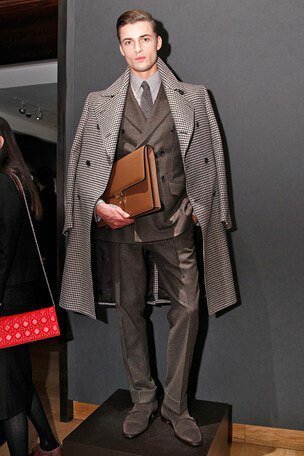 I don’t know about you, but I was simply glued to the presentations for London Collections: Men at the start of the year. As ever, they prove to be the height of sartorial inspiration for the fashionable chap and a true showcase for British fashion talent. Thinking back, this last LC:M just gone was, in my view, particularly fine. It was certainly one of the most exciting shows I’ve seen simply because British fashion seems to be developing a more united aesthetic. Even more excitingly, this reunification of British style across different menswear brands and sectors of the market, all seems to revolve around tailoring. The reason that I find this development so encouraging is because this indicates a real kind of symbiosis on the part of British designers, and increased appreciation of what British tailoring really stands for. British retailers are coming to all develop and support the kind of aesthetic that one might expect to be truly ‘British’ in tailoring terms. Permit me to explain. As I’m sure you’ll be aware, British tailoring has its own certain style – British suits, just like American, Parisian or Italian suits are made in a certain way, which conforms to the traditions of our unparalleled tailoring heritage. 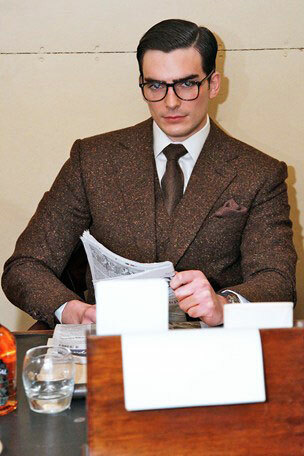 British suits are made with a very formal, sartorial shape. The jacket is cut long for an elegant line through the body and the trousers have a high rise. Lapels are imposing and broad when at their best, helping to add shape to the chest, which is often cut full and built-up using lots of structure for an impressive aesthetic. Jacket waists present a subtle hourglass silhouette, shoulders present strong lines, armholes are cut high for ease of movement and sleeve-heads are attached using an equally strong, defined ‘roped shoulder’ – whereby the sleeve-head is gathered and rolled into an angular ridge where it is attached to the body of the jacket, as can be seen from the photographs provided. American suits by contrast feature more gentle lines and often a looser, less angular shape. Parisian and Italian suits are generally considered more relaxed and contemporary, made with the minimum of structure, lighter cloths, slimmer lines and (in the case of Italian tailoring) soft set-in-sleeve ‘Neapolitan’ shoulders. 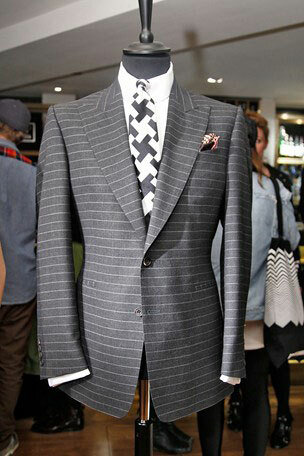 One can see then, why British tailoring presents a clear image on the world stage – British garments present a unique and quintessentially masculine style of structure and shape. As LC:M made clear, these aesthetic traits are not only re-establishing themselves, but the latest generation of highly talented menswear designers (and tailors) are confidently delivering menswear collections with an attractively modernised, yet tailoring-heavy British aesthetic. In essence, British tailoring is being made more relevant and appropriate for the modern man; it’s starting to pose more of a challenge to the dressed-down, easy to throw on Italian blazer. We Brits are rolling out full-cut flannel double breasted blazers, powerful, highly structured and sculpted three piece suits and impressive overcoats fit to burst. These developments are both refreshing and reassuring and indicate a renewed interest in imposing formalwear, over relaxed and dressed down tailoring in the international menswear market. Furthermore, the latest wave of British designs, seem to be on message not only in terms of style and structure, but in their use of colour too. 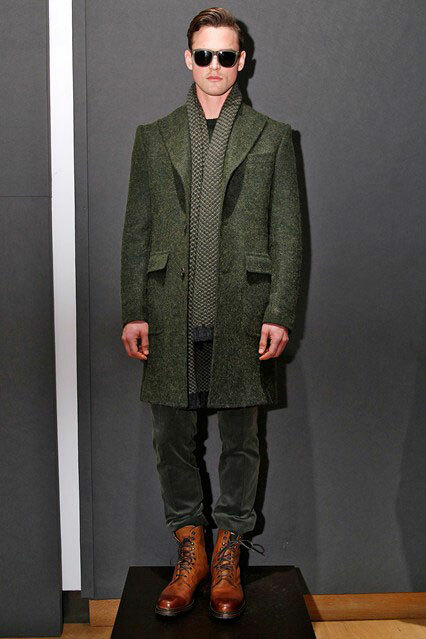 Tailoring companies, at all ends of the spectrum, presented a palate of deep forest greens, navies, charcoals, chocolate and taupe tailored pieces at LC:M making strong use of textured and subtly patterned cloths, classic stiff British white shirts and restrained pops of colour in their accessories. The selection of photographs provided come from Chester Barrie, Gieves & Hawkes, the Savile Row Bespoke showcase, and Marks & Spencer’s latest ‘Best of British collection’. Luxury designer tailoring, high-street style and Savile Row’s bespoke services are all on show here, and all echo one another in terms of colour and texture. Indeed, similarities in use of colour are so striking, that you might be forgiven for thinking that many of the great British tailoring companies had sat down in a room together and consciously made the decision to design around the same colour schemes, but no. Evidently, the rich, yet restrained use of colour running through so much of this season’s British tailoring, is a further indication that tailoring is once more benefitting from like-minded designers who have taken the time to understand and engage with classic British style. British tailoring has always had elevated status in the men’s fashion world, but in the modern age where clothing and lifestyle is becoming ever more casual and relaxed – the very antithesis of formal wear and dressing to impress – it is highly reassuring to see the identity of British tailoring finding a more secure and popular place than ever in the luxury menswear market.